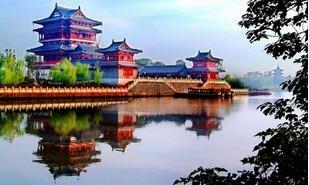 Situated in central Jiangsu Province with the Changjiang River flowing in the south and the Lixia River in the north. Taizhou, a famous historical and cultural city, is connected with the Northern Jiangsu Plain. Its principal scenic attractions are the Temple of Guang Xiaolu, the Park of Mei Lanfang the Chongru Temple, Taishan Park, and Rishe Park. People in the town of Qintong has a tradition to hold boat race on Qingming (the Festival of Pure Brightness) in early April every year. On the occasion, the local residents throng to the lakeside to watch boat race and theatrical performances, turning the place into a scene of jubilation.